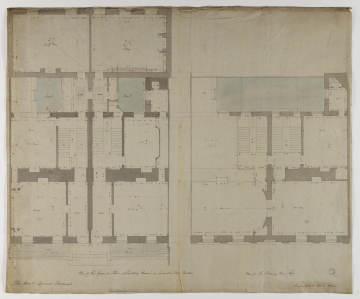 The left hand side of the drawing shows a survey of the ground floor and the right hand side shows a survey of the drawing room floor. Neither survey is complete as several rooms in No 59 (on the left) appear to have been locked up when the survey was made, and therefore the dimensions of three rooms (two on the ground and one on the first floor) are not given. The hand is that of Henry Hake Seward although the Office Day Books show that Charles Malton also worked on the plans of the house, so this drawing might have been a joint effort (see also drawing ). The house had been divided in 1751-52 by Sir Isaac Ware although by the time of Soane's survey there were already some breakthroughs between the two halves - one behind the staircase on the ground floor and two between the landings and the front rooms on the first floor. Interestingly, although the front of the house remained symmetrical when the house was divided - to the extent that the central window on the first floor was retained but blocked up - the rear elevation did not. Thus the Library has three windows whereas the Eating Room has only two. The total frontage is 57 feet 10 inches. The two front areas have staircases leading down to basements or cellars, although there is no corresponding survey of the lower level of the building at the Soane Museum.